For the last several years my wife and I have relied on tax professionals to handle our yearly tax prep. We do this not because our tax returns are overly complicated, but because of a particularly stupid and obvious tax mistake several years ago (no, you cannot claim both mileage and expenses on a vehicle when you own a business). We had the “pleasure” of an IRS audit. We made an honest mistake, but it was not an experience that we found all that enjoyable. A tax professional offered the benefit of someone far smarter than us who was able to make sure we got every tax benefit without the obvious downside of accidentally taking more tax credits than we were due. What I’ve noticed more recently, though, is that the professionals who used to take my year-end paperwork and enter it by hand were now using tax prep programs similar to H&R Block At Home to complete my taxes. Suddenly, those $300 tax prep sessions seemed less valuable. At Home’s user interface (we reviewed the Premium version) seems a bit austere compared to Intuit’s TurboTax ( ), but it still makes quick work of your tax prep. An initial interview determines any changes to your life during the year that might also change your tax status. Then the program runs you through a series of questions, beginning with basics such as your name, address, and social security number, and finishing up with the information provided to you by your employer or any other institution that has paid tax-related income to or received tax-related money from you during the past year. The entire interview process took a little over an hour to complete for the Federal forms and about 20 minutes more to finalize the state forms. At Home can import basic personal information from the address book app, but, oddly, the application doesn’t allow you to import your spouse’s information, so you have to type that yourself. Fortunately, if you’ve used the application during a previous tax season, much of this information can be imported automatically. 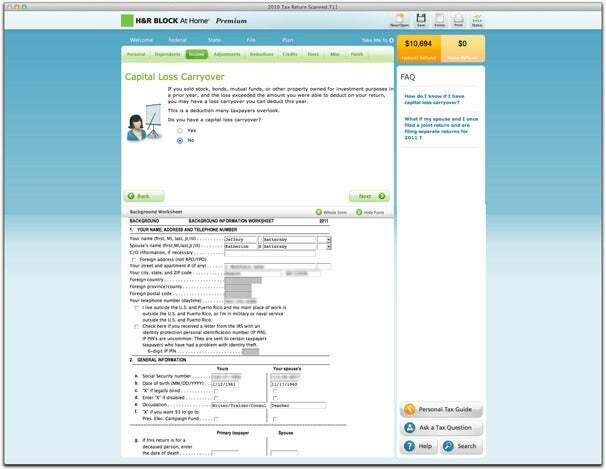 Form and Functionality: H&R Block At Home’s interview process gathers detailed information on your tax situation, filling in IRS forms as you answer each question. At Home can also import financial data from Quicken, MS Money, or any other program supporting the Tax Exchange Format. If you created your 2010 return using TurboTax or TaxACT, At Home can import that information from PDF files created using those programs. Unfortunately for me, the program was unable to import tax data from my professionally prepared tax return. While the program offers the option to automatically download and import your W-2 data, I had to manually enter mine. This wasn’t a surprise for my wife’s W-2 since she works for a small local school district, but my W-2 came from a large national payroll company, so I expected no problems. This isn’t an issue limited to the H&R Block application; TurboTax was also unable to import my W-2 data. A better solution would be to offer an OCR scan of an image of your W-2, a feature available in H&R Block’s and TurboTax’s’s iOS apps. As you enter your financial data, H&R Block At Home provides a running total of how much you’ll owe the IRS or how much you’ll receive as a refund. Once data entry is complete, the program runs a tax accuracy test to see if there are any missing forms or to determine whether or not any of the data you’ve entered is likely to flag an audit or is obviously incorrect. In my case an errant comma turned thousands of dollars into tens of thousands of dollars and, because I also file business taxes, H&R Block At Home would not allow my taxes to be filed until the IRS finalized a K-1-related form. One feature that makes H&R Block At Home particularly useful is a new tool that gives you access to a network of H&R Block tax professionals. If you have questions regarding specific deductions and whether or not you are eligible to take them or if you have any other questions regarding current tax law and how it relates to your situation, H&R Block At Home offers you the option of having real-time conversations with tax professionals. Your initial tax advice session is free and included in the purchase price of H&R Block At Home. Subsequent tax professional sessions cost $20. H&R Block At Home is an easy to use application that makes tax prep simple, offers tools to help you avoid audit-inducing mistakes, and if necessary, keeps a professional close at hand if you’re not sure how to handle a specific situation. At Home’s simplicity and the prospect of professional help inspire the confidence necessary to dispense with a tax pro and start using H&R Block At Home.